Thanks for shopping at Laurie Jo Designs. You have 30 calendar days to return an item from the date you received it. If an item is returned beyond 30 days, it will be donated to charity and is not eligible for store credit, or exchange. Only items purchased at the regular, full retail price are eligible for return. SALE ITEMS ARE NOT eligible for return or exchange. If you received a Laurie Jo Designs item as a gift, your item may only be exchanged for a different size. Your item must have the original tags still attached. Your item needs to be accompanied by a copy of the original invoice/sales draft. When returning an item, please indicate your reason for returning the item. If your return is approved, we will issue a store credit or replace/exchange the item. You will be notified that your exchange or replacement has shipped. Shipping and handling costs are non­refundable. You will be responsible for paying for your own shipping costs for returning your item. 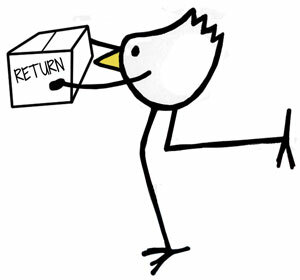 You may want to insure your return; Laurie Jo Designs is not responsible for lost or misdirected returns. 3528 A Ocean View Blvd. If you have any questions regarding your order or the eligibility for return or exchange, please feel free to contact us. We want you to be happy and satisfied with your purchase. We are nice people and easy to work with.